CONNECTION TO NATURE. The attached garage is ubiquitous in new construction in New England’s cold climate. 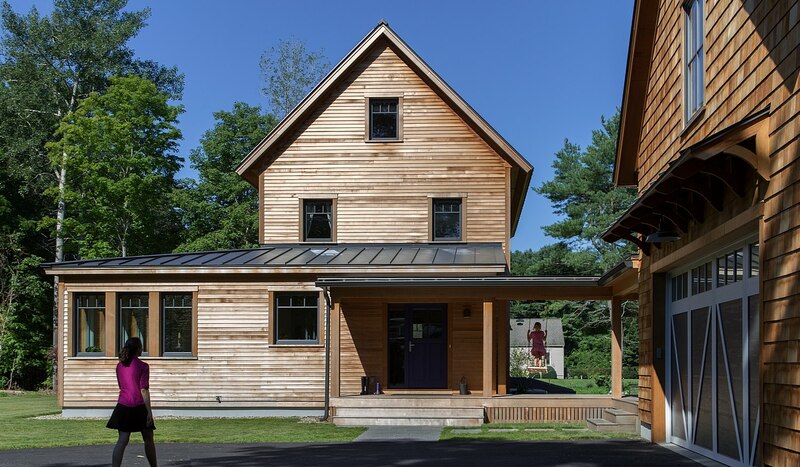 This home’s barn-inspired garage is intentionally detached from the main dwelling. A covered walkway connects the two structures, creating an intentional connection with the outdoors between auto and home. FUNCTIONAL FLEXIBILITY. With a modest footprint, each space must serve a specific use, but also be flexible for atypical scenarios. The Mudroom serves everyday use for the couple and their children, but is also easy to tidy up to receive guests, eliminating the need for two entries found in most homes. 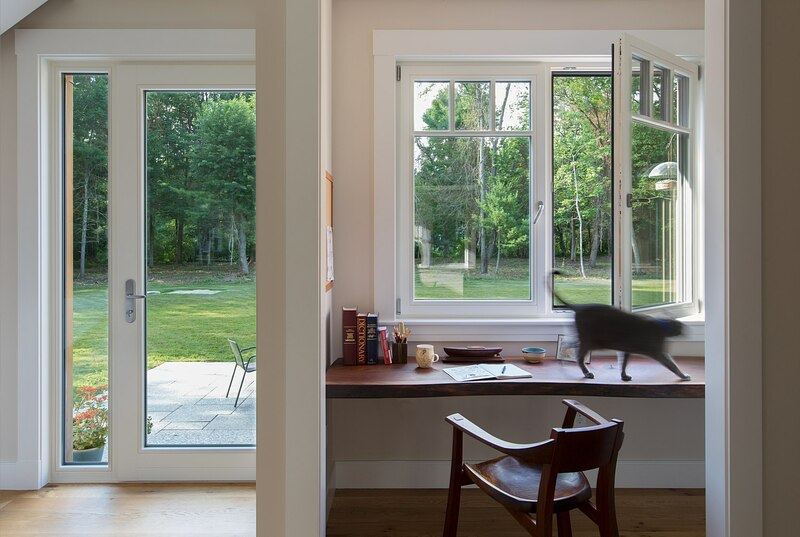 A workspace is conveniently located off the mudroom; it looks out on to the back yard to supervise the children and can be closed off with a sliding door when not in use. The Away Room opens up to the Living Room for everyday use; it can be closed off with its oversized pocket door for secondary use as a guest bedroom with en suite bath. FOOD PRODUCTION. After clearing all invasive species, apple, pear, peach and cherry trees were planted. Future plans include blueberry, raspberry and strawberry bushes, along with raised beds for vegetable gardening. The house also offers a below ground root cellar, built outside the home’s thermal envelope, to gain the passive benefit of long term energy-free food storage. RESILIENCY. The home’s ability to weather unforeseen challenges is predictable – it will fare well. The super-insulated envelope means during a winter storm with power outage, heat loss will be slow – taking days to drop to 60 degrees even with no heat source. During normal conditions, reduced energy consumption plus energy production means shelter from the burden of utility costs. Surplus production can power electric cars & appliances. The home exceeds snow & wind structural requirements, plus far surpasses standard construction for long term durability planning. NET POSITIVE ENERGY. The all-electric home consumes 70% less energy than a code-built house, and with measured energy data produces 48% more energy annually than it consumes, making it a ‘net positive’ home. 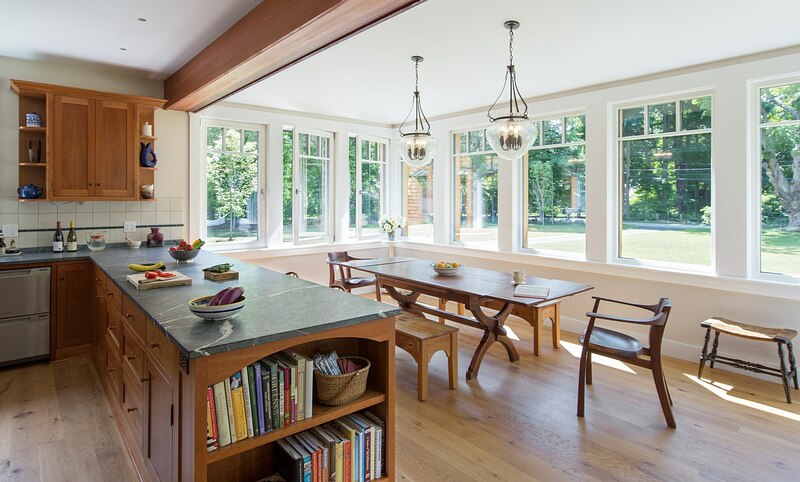 Thick walls and roofs lack thermal bridging, windows are high performance, triple-glazed, and a continuous air barrier yields minimal leakage (0.27ACH50) making the home among the tightest in the US. Systems include an air source heat pump, an energy recovery ventilator, and a 13.1kW photovoltaic system to offset consumption and support future electric cars. 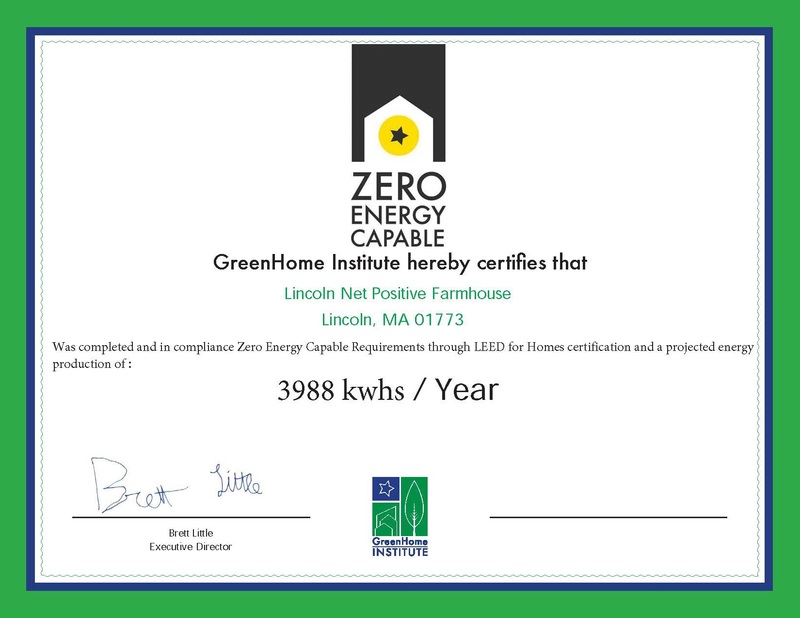 o 5,300 kwh net surplus, equivalent to 15,000-25,000 electric car miles per year. 48% net positive. Thick walls and roofs lack thermal bridging, by using dense packed cellulose and continuous rigid insulation. 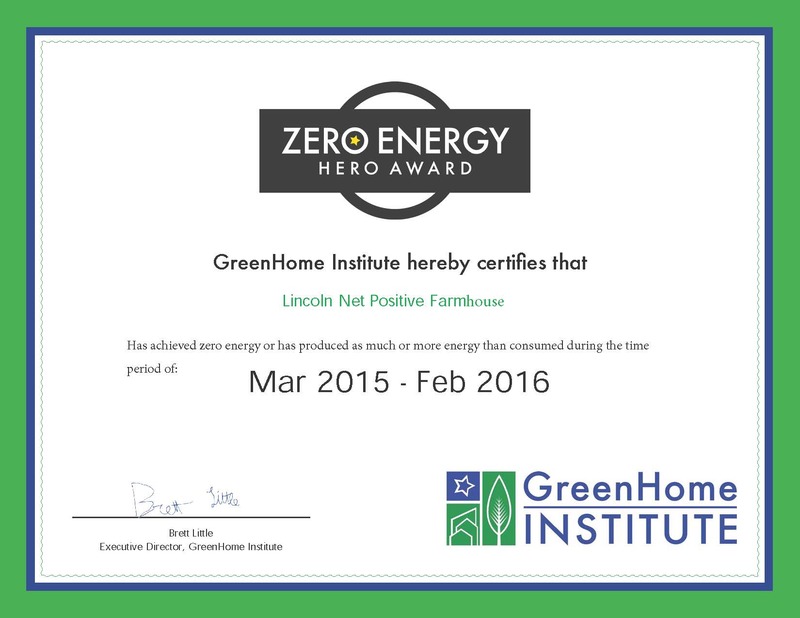 High performance, triple-glazed windows round out the super-insulated building envelope. The continuous air barrier yields minimal leakage, with testing revealing only .27ACH50. An air source heat pump and an energy recovery ventilator ensure that the house stays warm in the winter, cool in the summer, and provide a constant supply of fresh, clean air throughout the year. A heat pump hot water heater, Energy Star appliances, induction cooking complete the high-efficiency package. A 13.1kW array of solar panels produces more than enough energy each year to offset consumption. A circuit-by-circuit energy monitoring system allows the owners to track their energy consumption and production. 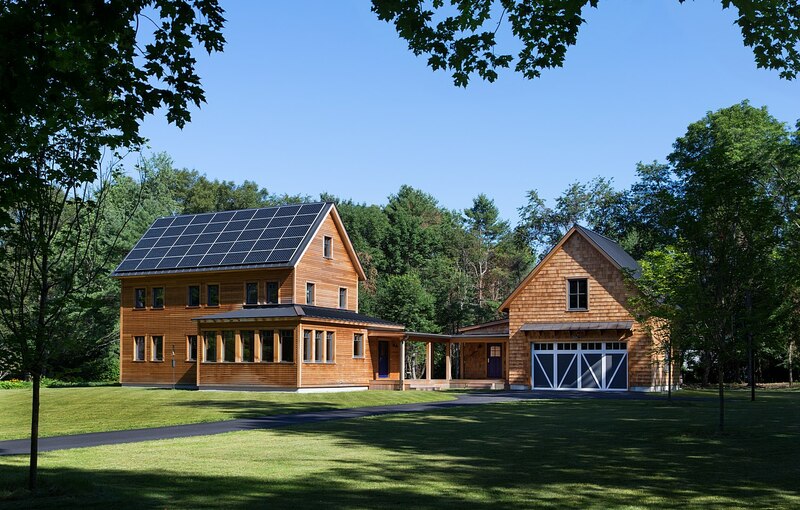 This Certified Zero Energy Capable, LEED Platinum Certified modern farmhouse ties into the cultural landscape of Massachusetts – a town known for its rich history, farming traditions, conservation efforts, and visionary architecture. 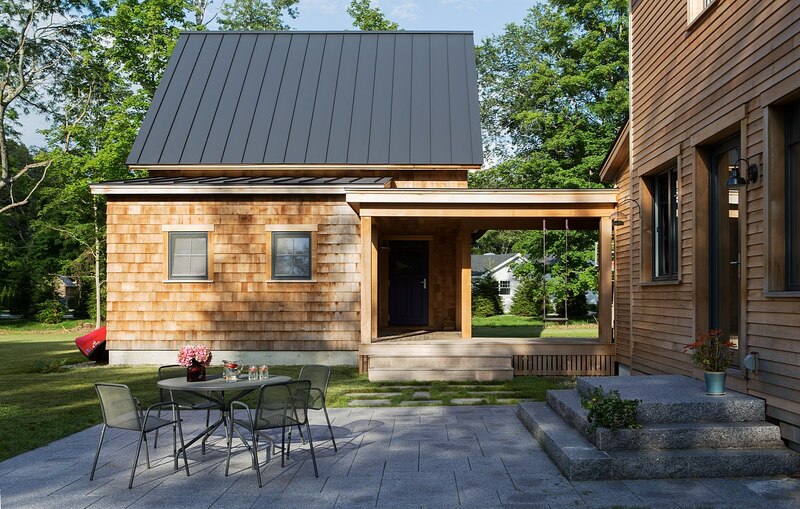 The goal was to design and build a new single family home on 1.8 acres that respects the neighborhood’s agrarian roots, produces more energy than it consumes, and provides the family with flexible spaces to live-play-work-entertain. The resulting 2,800 SF home is proof that families do not need to compromise on style, space or comfort in a highly energy-efficient and healthy home.